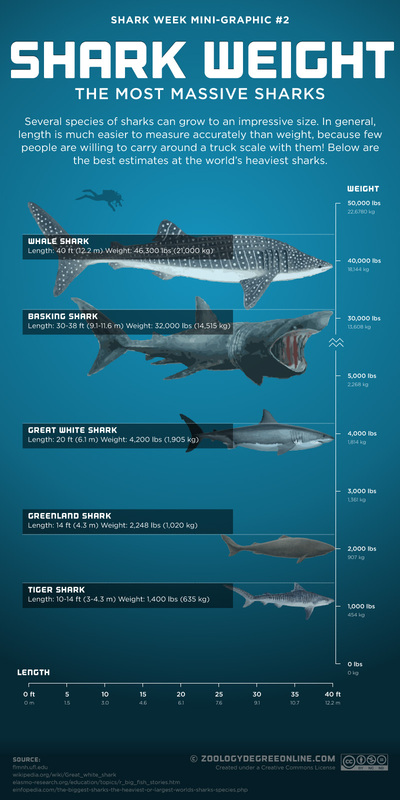 It may surprise you just how heavy some sharks are. The largest shark, the whale shark, is two feet longer than a typical school bus and weighs more than twice as much! Luckily for us and most of the sea creatures out there, the two largest sharks alive today feed mostly on plankton. That makes the Great White the largest predatory shark. On the other end of the scale the Dwarf Lanternshark is currently the smallest known shark, reaching only 8.3 inches (21.2cm) in length. Infographic courtesy of Zoology Degree Online. This entry was posted in Animal Facts, Animal Infographics and tagged Infographics, Sharks by animalpages.Bookmark the permalink.